Are you confused about pruning fruit trees? It's really not that hard, but let's start with the easiest, most forgiving of all the fruit trees. Pear trees are generally easy to grow and maintain. This is one type of tree that tends to be self-thinning to save you some work. The best time to do major pruning on your pear trees is during the dormant season, before active growth begins in the spring. Generally, it is not recommended to heavily prune pear trees. 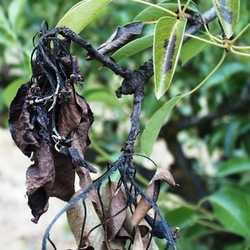 The more you prune, the greater the chance that fire blight will develop (the leaves and branches will look as if they have been burned by fire), and it delays fruit production. It is generally best to prune pear trees late in the summer. You will stimulate the least amount of re-growth by pruning after the trees have finished growing for the year and have hardened their wood. If you live in an area where there's a chance for winter damage, wait to prune until late winter. Give your pear trees the proper growing environment. 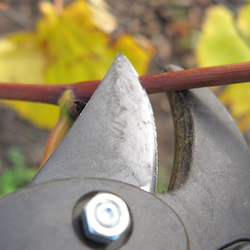 Then maintain a regular pruning schedule to enhance the best possible fruit production. Set a three-year plan to get your pear trees into the shape and size you want. Start with a plan for your pruning project - envision how you want the trees to look. The first year remove limbs that are diseased, damaged, upright, crossing and crowded. Suckers need to be removed as soon as you notice them to avoid them turning into woody, weak wood. The next year, thin out the tree some more and bring down some of the height. The third year, thin out the trees some more and cut down to the desired height. Always remove pruned branches from the area of your other trees. Burning the branches is a great way to prevent the spread of disease and infestation. Pear trees bloom and bear fruit on the sharp, short spurs that grow between its branches. Thin the spurs regularly. Older spurs should be removed occasionally to be replaced by more vigorous young ones. If you end up with too many small fruits set in one year, thin them out to let the remaining fruit grow large and not have to compete for nutrients. 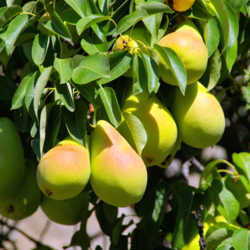 You can avoid ending up with too much fruit that goes to waste by thinning the fruit on the branches after it has set. Hand thin the fruits to leave at least 5 inches between the fruit. This will reduce your harvest and increase the health of the remaining fruit. It is especially a good idea to thin fruit on the high, hard-to-reach branches. Do check with your local extension office about the best choices of varieties of fruit trees that will do well in your area. There a many new varieties of both pear and apple trees that have been cultivated to be very resistant to fire blight. This is one disease that can easily severely damage and or kill your fruit trees. The leaves and twigs of the trees get the disease from insects who enter the flowers during springtime. The best way to prevent the disease is by choosing a resistant variety. The insects get it by gathering pollen from nearby cedar trees. It also helps to keep the tree plenty moist, especially during blossom time and when the fruit is ripening. Using mulch around the base of the tree will help hold in moisture and may also prevent too-early flowering. Prune your tree lightly. This will avoid producing vigorous new growth that is more susceptible to blight. If your tree has already been hit by fire blight, you will need to prune out the affected shoots at least several inches below the damaged area. Be sure to sterilize your clippers in a chlorine solution between cuts and destroy the cuttings by burying or burning them. If your tree is badly damaged, it may need to be replaced. Please see the following link for drawings of proper pruning and additional information on the subject. CREDITS: Personal hands on experience. Additional information found at public domain sites. Hubby and I have been doing Organic Gardening off and on for over 25 years. Just finishing the Virginia Master Gardening classes at the end of Nov 07. I love talking and teaching gardening to anybody that will listen.